Tonight on HBO Boardwalk Empire returns with the second episode of Season 2 called ‘Ourselves Alone.’ On last week’s show everyone was turning against Nucky, even his inner circle. If you missed last week’s episode you can catch our official recap here! 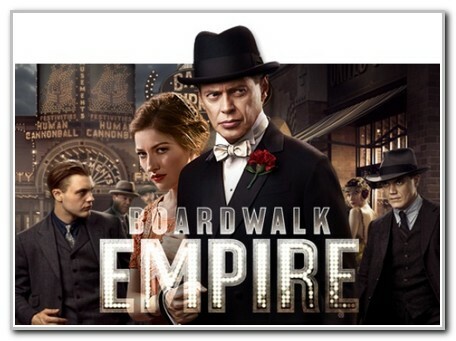 On tonight’s episode we know Nucky won’t take this all sitting down so because he is worried about losing his grip on Atlantic City, he deliberates a counter-move while trying to learn who in his inner circle betrayed him. Official recap: We open the show with Margaret Shroeder coming down and speaking to the maids. They show her the newspaper and it seems that Nucky has been arrested and is in jail. Margaret does not seem very upset about it. Margaret calls Mr. Kessler and he tells Margaret that the reports are not accurate. Margaret wants to go to the jail but he tells her Nucky has gotten bail. Over at the jail Nucky is in jail and he tells Chalky that he is in a precarious situation. Nucky tells Chalky that the Klan came for him because the Klan thought that Nucky could not predict him. Nucky is questioning Chalky and trying to find out who is behind all this, who is betraying him. The guard comes in and tells Nucky he has made bail and Nucky tells Chalky to be patient. Nucky is being told that it is the governor that is behind his arrest. They do not have the warrant yet but there are two confidential witnesses who have squealed on Nucky. We know the attack has been staged by The Commodore. Over with Nucky as he comes out of his office and the reporters are waiting. Nucky tells them a joke and the reporters are not impressed. Nucky tells him that is not the best joke, the best one is that tax payers money is being wasted for revenge. He tells them he is not using the press he is using the same system that has gone against him and he is going to put this issue in the trash. Over with The Commodore he comes in and Damien is talking about him and he has Damien pick up a tusk that he cannot lift. The Commodore takes it from him and lifts it over his head making Damien look like a fool. The commodore is trying to make himself seem younger and has dyed his hair. Commodore Kaestner is happy that all the people including Nucky’s brother showed up. Commodore is telling them all Nucky Thompson is about to go to jail. They want assurances, Commodore tells them Nucky is going to jail thanks to Ryan. They ask who is going to run the alcohol business and the Commodore tells them Jimmy and not Chalky, he does not work with blacks. Over with Chalky his wife has come to jail to visit him, she wants to know how long he is going to be there. His son wants to visit him and he tells her it is not a good place to come. His son Lester has sent him a book (David Copperfield) The guards come and tell her she has to leave. Chalky is reading the book his son sent him while another prisoner (Don) taunts him. The jailer comes in and tells him he has to move him and moves him with five other black men and one is the prisoner that was taunting him (Dunn). Chalky goes and reads his book and ignores the other prisoner but he just keeps taunting him. He starts to make comments about Chalky’s wife. I can feel this is not going to end well. Over with Nucky he goes to his office and tells his secretary he wants her to call the Mayor and the Alderman and he needs them to come over right away. He also asks her to call a florist. Over at Margaret‘s a bouquet of roses is delivered to her and the maids ask her if it is from Nucky. Someone comes to the door and it is Owen Sleater and he assists John McGarity and Margaret does not know him. He is coming to check out the house because John is coming and wants to make sure it is safe. Over with Nucky, The Mayor (Ed) comes in and Nucky wants to know if he was approached about turning against him. He tells Ed that he is going to beat this and when he does he will remember who showed up today and who did not. The secretary tells Nucky that Mr. Kessler called and it is safe to go back to his office. Neri is talking to the Councilman who are working with Nucky and he is trying to convince the guys to go with the Commodore. Over with Jimmy he has showed up at the poker room and is seeing Myer Lansky and Charlie. Jimmy is telling him he needs Rothstein. Myer is telling Jimmy that they have to put aside their differences and they can be trading partners. They buy liquor from Jimmy and Jimmy buys heroin from them. Nucky shows back at his office and find they have gone through his things. Nucky’s butler tell him one of the councilman has to talk to him. The Councilman tells Nucky he tried to speak up for him but no one would listen they just seen dollar signs. The phone rings and it is Eli, Nucky’s brother. He asks him how it feels to sit at his empty desk all alone. Nucky tells him to tell him he wants to get out and he will help him, but he has to tell him now, because in a minute it is going to be too late. Eli does not ask for help. Nucky leaves the office and tells him butler that he has a dinner engagement. Over with The Commodore and Eli he is being introduced to the old power brokers the men who made Atlantic City by The Commodore. Back at prison with Chalky the other prison (Dunn) is asking him what Tom is up to so far in the book (David Copperfield Chalky is reading) Dunn put his finger on his book and Chalky asks him to get his finger off his book. He thinks Chalky acts uppity and he rips a page out of the book Chalky’s son gave him. There are four other prisononers in the cell and Chalky talks to each of them who he has helped in one way or another. Dunn (other prisoner) goes to punch Chalky and the four guys don’t let him next to Chalky and they beat the crap out of him. They give Chalky his book back and Chalky asks which of the four guys can read and he gives him thee book and he starts reading David Copperfield. Over at Margaret’s house John McGarrigle is having dinner and he is not eating. She served lamb and he eats nothing that has a cloven hoof. He is so dour, he is clearly a real fanatic, he tells Margaret he wants to drive the English out. Nucky walks in, he apologizes for being late. Margaret is clearly happy Nucky is back. Over with Jimmy, he removes a knife from his boot. He is walking through a dark park and standing at the Statue of Temperence. Someone follows him and two of Masserati’s men walk up to him with guns they want the money he won. Jimmy cuts one of their throats and kills the other. Back with Nucky and John McGarrigle (Sinn Fein) he tells Nucky that the English have killed the Irish and he needs money to buy guns and he was told that Nucky is a loyal son. Nucky asks how much he wants and John replies what do you have? He goes to write a check and he tells John to remember who his friend is. He tells Nucky that his man Owen Sleater will be staying and he asks Nucky to help him out. Nucky agrees. Everyone leaves and Nucky tells Margaret he knows they have to talk. She asks if they have a case and Nucky says yes. She asks who is against him and he tells her everyone. He tells her that they ransacked the suite and they got his ledger book and $20,000 in cash. She tells him he is smarter than his enemies but he is not thinking and she takes out his ledger and money and gives it to him. (That is what she was doing impersonating a maid) She tells him he must burn the ledger and future dealings must be memorized. She throws the ledger into the fireplace fire. He tells her he sent her flowers for Valentines and never signed the card. She told him she knew who it was from. She kissed him and tells him he is exhausted and needs to come to sleep in their bed. Bagpipes play and the show is over. I think this is one of the best shows on television. What did you think of it? Are you enjoying the show this season? Sound out in the comments below!